Cast yourself back to 1992; that year we were blessed with the unbridled and unashamed addictive brilliance of entertainment that was Super Mario Kart. Like the series from which this was derived, it paved the way to yet another Mario franchise that would be continually rehashed for all future Nintendo systems. After the sluggish disappointment of Mario Kart 64 and the Gamecube’s enjoyable Double Dash! antics, the Wii provided a new innovation in control and interactivity to stretch out the Mario universe’s Go-Karting action. Harking back to the steering wheel controls of yesteryear, but much more responsive, this felt like an entirely fresh Mario Kart, and not just because of the impressive Wii Wheel. A plethora of characters carried over from the Gamecube and DS, new tracks and even new vehicles came to prominence, not to mention online multiplayer racing giving even more scope to the debatably-ageing series. 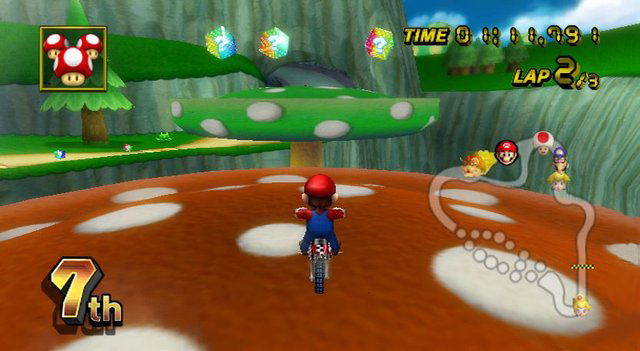 These additions made Mario Kart good again, great indeed, but not quite perfect. I have an issue with it, this may be slightly picky to a more casual gamer, but I expect the best from a Mario title so hear me out. After all, I played Super Mario Kart to the absolute limits back in the day, so if this doesn't match up to it, I’m not afraid twist the ear of Luigi, Bowser and, if he even has ears, Toad. So, wait for that flying Lakitu to give the starters orders and let’s gooooo! Ever since the SNES gave us the joy of the famous plumber’s racing sideline, Nintendo have never strayed from the core winning formula. 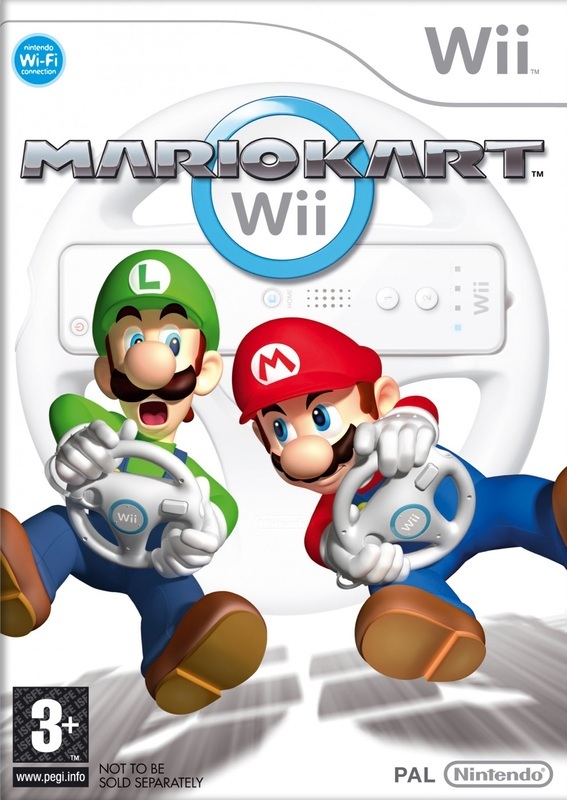 The faithful amalgamation of family favourite characters, devilish and speedy tracks and themed slapstick weaponry is thankfully in abundance on the Wii’s interpretation. Additional to this were the important multiplayer options, and this is where the Wii pragmatically takes this Mario Kart up into planetary orbit. 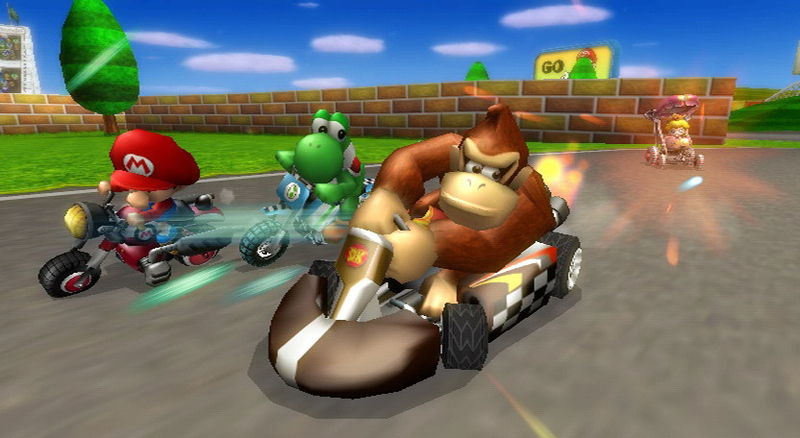 Extremely easy to access and utilise, all the functional aspects of Mario Kart Wii are straightforward. From the newbie to the veteran, the entire game is set out uniform and structured, user-friendly without lapsing into monotony, making it ideal to pick up and play in a party situation. Solitary play is also well catered for; the Time Trial and Grand Prix modes are challenging and extensive, with many unlockable cars, characters and tracks, making for a lot of decent dark-room game time. All-in-all, it has a slick appearance, none more so than the title screens and menus; backed with exciting race themed music which is quite excellent, I particularly like the way the music subtly goes up-tempo nearing the end of the selection process, and the animated windows and backgrounds add a final sparkle that really make the presentation stand out. Topping off the audio are many original in-race themes and revitalised versions of SNES, GBA, GC, N64 and DS arrangements, thankfully unspoiled which again is pleasing for the retro gamer. SFX is noisy, numerous and apposite, but not so much to ruin the action save for a couple of stupidly OTT explosions. These are rare in all honesty, but can make the player briefly lose their bearings in the heat of the racing. Nice quirky additions of character shouts and voices raise a smile behind the wheel also. Visually, MKWii acquits itself well and impresses, but you would expect this of a flagship game. The vital design and depiction of the tracks are chief among matters, and things are good, really very good. Tremendously colourful, with solid models (although some can appear a bit blocky) and boundaries, animations, effects and a fine frame-rate. In fact, it’s surprising how it all flows consistently well in any mode; even in online play there’s scarcely a hint of lag or corruption. Movement of the vehicles and surroundings is top drawer, and it all feels rigid and well thought-out. It’s all pretty much glitch free too, although a rare dodgy camera angle can crop up when falling off the track or after a big collision. While the tracks themselves are well laid out, a couple can feel a little rushed and not exactly remarkable, with weird turns and item block placement sometimes making no sense. However, even though they are nicely rendered and quick, small details can become pronounced. Some obstacles and supporting backgrounds can look a little flat, the rough areas are sometimes unclear and the barrel blasts are lazily designed. They come at you like flat, giant grey discs, and take a little getting used too for sure. The Mii’s jumping around the sidelines get on my nerves too; as they look so out of place amongst the generally glorious-looking Mario-themed environments. Mario Kart Wii has more race tracks then any previous incarnation; with 32 raceways and 10 battle courses. Split 50/50 between originals and recreations of tracks from previous games, it’s the most extensive and varied mix yet, with hardly any of the tracks feeling too similar to one another. I feel a few favourite courses have been overlooked; Ghost Valley 1 and Battle Course 2 from Super Mario Kart for example would have been very welcome, but alas they are missing. I suppose not everyone will be happy, but at least the choices they have included are well realised with a fine nostalgia/modern manifestation, and not overdone. More notably, and more annoyingly omitted are the one-on-one battle mode (teams only) and multiplayer grand prix mode, the latter of which is just criminal to be absent but both are sorely missed. These missing modes can be upsetting to the die-hard fan, as they are to me. It’s not the end of the world however as there is a whole lot more to be getting on with, and the verses races provide that party gameplay feeling if you hanker for it. This is also supported by a challenging difficulty in the 150cc and mirror classes; it takes time and effort to find your right character/vehicle combination to suit your ability and ultimately succeed at this level. Although the proper battle mode is not present, the fairly enjoyable team battle contains an element of luck about it which is not fully in the players control, and funnily enough this is kind of a recurring issue with this game, and is certainly the biggest problem with Mario’s sixth racing season. Some of the newly introduced weapons could be described as ill-judged, as they have a side effect of removing a fair bit of skill out of the game. The Spiny Shell, POW Block and the classic Lightning weapons recur far too often, and lady luck will have to be looking at you to win the harder races. If hit by several in sequence, it’s possible to go from 1st place with a clear lead to last in a matter of seconds, with little chance of recovery. Worse still, you have absolutely no control over this. That’s fine for a casual session and throwaway multi/online play, but in singles competition this can get ridiculous. A seasoned racing game expert would get furious with this, as their skills become negated in the process. This characteristic brings a significant fault to the gameplay of Mario Kart Wii in solo modes and could annoy you to the point of quitting in revulsion. It’s a pity, because in many respects the Mario Kart flag is flying high and proud on the Wii. The control system using the wheel is excellently attuned and astonishingly responsive. I personally forgo using the standard controller, I find this difficult to use this effectively. However, some players prefer this input, even using the nunchuk to good effect. Additional Mario magic help it along nicely too; the jump tricks are fun and effective if performed correctly, the roster is extensive, difficulty curve well judged and generally very appealing in presentation. Not the finest Mario Kart game, the first still holds that acclaim for my retro-loving soul, but a relatively snazzy, entertaining, polished and action filled entry to the most celebrated kart racing series out there.